Last week, LG informed the world that it would announce its G5 smartphone on February 21 at MWC 2016, without providing any particular details about the device. Today, the company revealed one of the features that the G5 is bringing: an "Always ON" display mode, which will let users see incoming notifications (like missed calls, messages, or emails) without turning the entire screen on. This always on screen feature, which is already available in slightly different implementations on Motorola smartphones (called Active Display), as well as on Google's latest Nexus handsets (called Ambient Display), will likely also be found on Samsung's Galaxy S7 and Galaxy S7 edge - both of which are going to be announced on the same day as the LG G5. 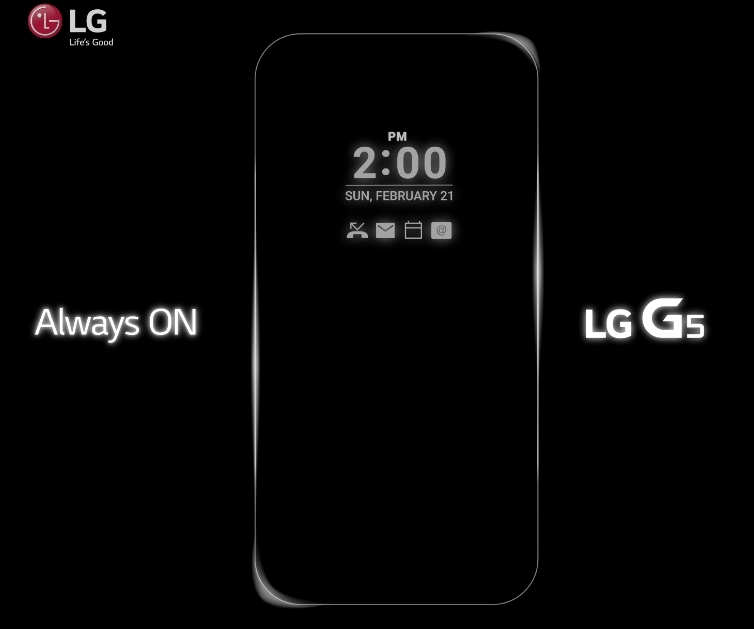 The image revealing LG's new Always ON feature - embedded below - also shows an outline of the G5 itself, allowing us to speculate that the previously leaked LG G5 diagrams and renders (see here, here, and here) may have been accurate. It's said that the LG G5 will be significantly different from its predecessors (G4 and G3), as the handset is reportedly made out of metal, while offering a fingerprint scanner and a dual rear camera. To find out more about what to expect from the upcoming smartphone, check out our LG G5 rumor roundup.